UNITE. SUPPORT. MAKE A DIFFERENCE. Looking for details on the 2019 Patriot Tour™? Click here. Are you a veteran or know a veteran needing help? Click here. Again, we cant thank all of you enough for helping us reach this amount of money all going back to helping our veterans here in Arizona! 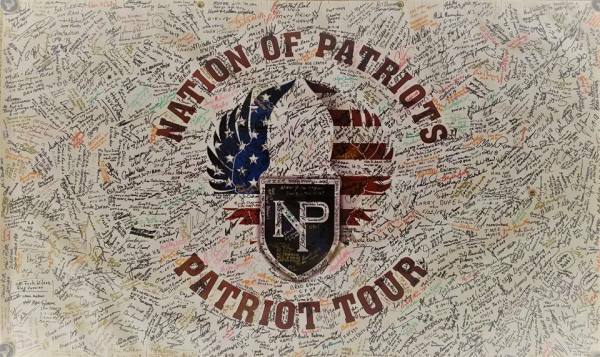 We had the privilege of being awarded this by Nation of Patriots™ for raising the most money during The Patriot Tour™ in 2017 and 2018 while we had the flag in our possession. Truly grateful and hope we raise the bar this year with all those who support us! We had the privilege of being awarded this by Nation of Patriots™ for raising the most money during the course of the fundraising period within our prosepective region. 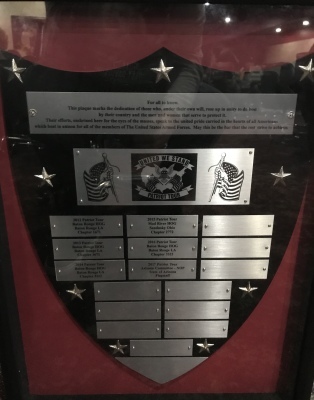 We had the privilege of being awarded this by Nation of Patriots™ for raising the most money during the course of the fundraising period (November 1, 2017 - October 31, 2018). The Flag was received back in Beaver Dam, Wisconsin at 2:00pm on September 8th. 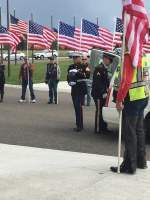 One American Flag passed over 14,000 miles, 110 stops in honor of US military veterans, enlisted, retired and fallen. This massive feat was accomplished by thousands of participants who worked in unison to raise tens of thousands of dollars for disabled veterans and their families! We are so very proud of our country. Thank you to all that carried the Flag, participated or just tuned in! Time to get ready for 2019 and our 10 year Anniversary! This banner travels with the flag for all participants to sign. The purpose of the Missing In America Project is to locate, identify and inter the unclaimed cremated remains of American veterans through the joint efforts of private, state and federal organizations. To provide honor and respect to those who have served this country by securing a final resting place for these forgotten heroes. The Missing in America Veterans Recovery Program (MIAP) (EIN: 20-8408832) is a Federal recognized Non-Profit Veterans Organization for the identification, location, verification, and movement of Veterans and their Dependents. "McCain was born in 1936 in the Panama Canal Zone and was the son and grandson of Navy admirals. McCain attended the U.S. Naval Academy, graduating in 1958. He trained as a naval aviator at Pensacola, Florida Naval Air Station and at Corpus Christi, Texas Naval Air Station. In 1960, he served in deployments to the Mediterranean on the USS Intrepid. He also deployed on the USS Enterprise, the Navy’s first nuclear-powered aircraft carrier. In 1963, he was assigned to Meridian Naval Air Station in Mississippi as a flight instructor. In 1967, while deployed to Vietnam as part of Operation Rolling Thunder, McCain’s plane was shot down and he was captured by North Vietnamese forces. He was held at “Hanoi Hilton” and “the Plantation,” two camps nicknamed by American pilots. He was a prisoner of war for more than five years. He returned to Vietnam in November 1974 where he and other prisoners of war received the National Order of Vietnam. McCain also served as a Navy liaison to the U.S. Senate before retiring from the Navy in 1981. For his service, McCain was awarded the Silver Star, Legion of Merit, the Distinguished Flying Cross, the Bronze Star, a Purple Heart, and the Prisoner of War medal. His name was added to the USS McCain which is also named after his father and grandfather. McCain was elected as the U.S. Representative from Arizona’s 1st District in 1983 and was elected senator in 1986. During his time as a senator he co-authored legislation establishing the 9/11 Commission and sponsored legislation to strengthen airport security. He also was part of the bipartisan Campaign Finance Reform Act and a bipartisan effort to normalize relations with Vietnam. McCain was diagnosed with brain cancer in July 2017. He returned to the Senate after his diagnosis to continue work as chairman of the Armed Services Committee. He passed away on Aug. 25, 2018, at the age of 81. He is survived by his wife, Cindy and seven children. He will lie in state at the U.S. Capitol and Arizona Capitol. In accordance with his wishes, he will then be buried at the U.S. Naval Academy Cemetery in Annapolis, Maryland. ​​The initial focus of the MIA Project will be a massive, nation-wide effort to locate, identify and inter the unclaimed remains of forgotten veterans. 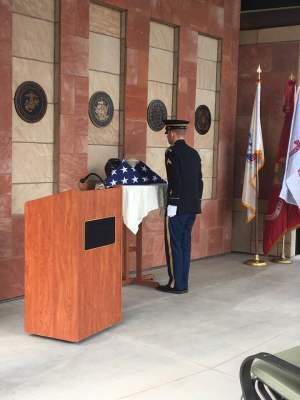 This task will be executed through the combined, cooperative efforts of members of the American Legion, other volunteer service and veteran organizations, local Funeral Homes, State Funeral Commissions, State and National Veterans Administration Agencies, and the State and National Veterans Cemetery Administrations. 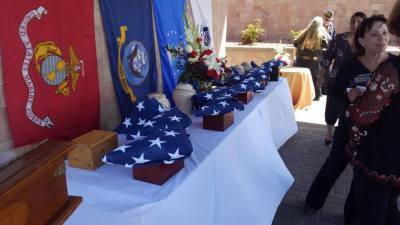 Local, state and national laws must be followed in the identification, claiming process and proper interment of the unclaimed remains of forgotten veterans. 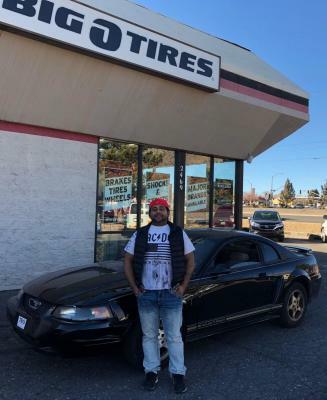 "Over the recent holiday season Nation of Patriots and Big O Tire in Flagstaff both contributed to help a veteran in need. Michael Walbridge served in the Marine Corps where he served in two deployments in the Middle East working as an amphibian assault vehicle crewman. 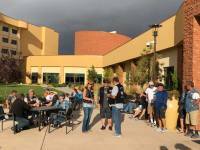 He's now a a student at Northern Arizona University where he is studying to become a counselor so he can help other veterans who suffer from PTSD and physical challenges." "Just before Christmas, the front end of his car failed. Walbridge had his car towed to Big O Tire where he was told the necessary repairs would cost $1,500. He then reached out to Nation of Patriots for financial assistance. Nation of Patriots is a nonprofit organization that works on to promote the awareness of and financially support wounded veterans and their families." "Rick Bitzer, chairman of Arizona Nation of Patriots, said the organization paid the invoice. But in the course of the repair work, more problems were found with the vehicle. But instead of requiring payment for the additional repairs, Big O completed $700 more in repairs for Walbridge at no extra charge so he could get back to school and life. "Big O stepped up and did all the additional repairs at their expense to give back to someone who has given so much," Bitzer wrote in an email." Veteran Michael Walbridge and his car. After Walbridge had car trouble in December, Big O Tire and Nation of Patriots both helped him get back on the road. Smith served in Vietnam and said he hated coming back to people calling him names for wearing the uniform. 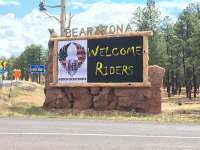 “Dan and I, along with some our team members, travel all over Arizona year-round speaking about the challenges our wounded veterans face and why it is so important to recognize their sacrifice,” Bitzer said. Bitzer said he also rides for friends like Steve Sunda, who served during the Cold War and never saw action in a full-blown war, but watched the Berlin Wall come down. Ted Martello served a number of tours in the Middle East and has Post Traumatic Stress Disorder, or PTSD, which he manages every day and works to help other veterans in the same boat. Bill Sherer did not serve in the military, but founded Nation of Patriots when he saw his friends coming back from active duty and struggling with day-to-day life and personal issues. 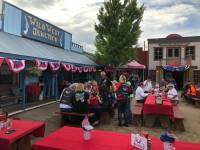 WILLIAMS, Ariz. — The Arizona Nation of Patriots will start their portion of the annual Patriot Tour in Kingman July 7 in an effort to raise funds for military veterans and their families, said Rick Bitzer, chairman of the volunteer organization in Flagstaff. 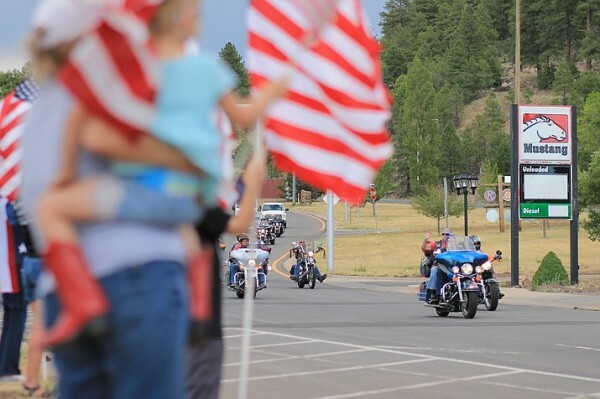 Nation of Patriots gained a huge following after forming in 2008 and launching their Patriot Tour the next year, carrying the U.S. flag through 48 states. 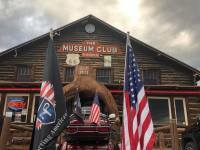 The 2018 Patriot Tour kicks off in Beaver Dam, Wisconsin, on May 19, with riders escorting the flag from one destination to the next for 100 days, culminating back in Wisconsin. 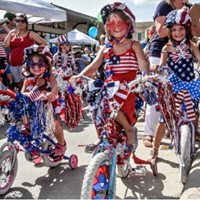 About 100 riders are expected to converge on Kingman for a celebration, flag exchange and lunch at the Elks Lodge. The tour proceeds to Williams, Payson, Flagstaff and Twin Arrows Casino to Gallup, New Mexico, where the Arizona Patriots will pass the flag. 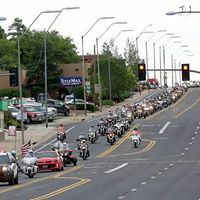 The flag and riders will arrive in Williams from Kingman and Seligman, via Route 66, July 8. Williams is the first and only Nation of Patriots city in the United States. “Bill, our national founder, will be in town Thursday … the first time Bill came to (Williams) a few years ago he was extremely impressed by the patriotism and the down home Americana. 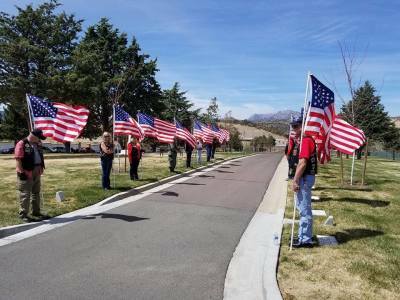 The patriotism and support that the people in Williams showed is what he had in mind when he set this up (Nation of Patriots). 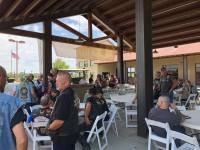 To him that was the epitome of what this rides all about,” said Dan Smith, regional commander of Arizona Nation of Patriots in an earlier interview. All of the money raised in Arizona goes to veterans in the state who meet the organization’s criteria, Bitzer said. 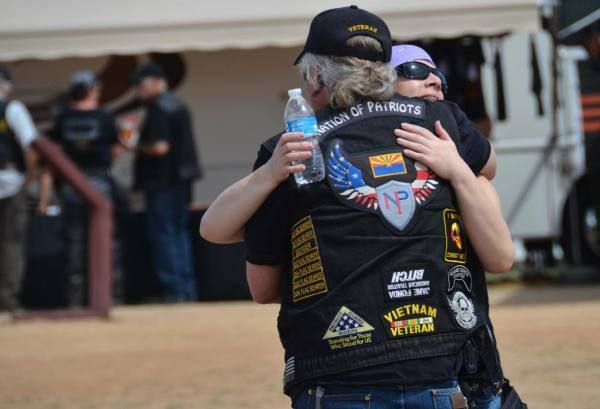 KINGMAN – The Arizona Nation of Patriots will start their portion of the annual Patriot Tour in Kingman on July 7 in an effort to raise funds for military veterans and their families, said Rick Bitzer, chairman of the volunteer organization in Flagstaff. Dan Smith, regional commander of Arizona Nation of Patriots who accompanied Bitzer on his Kingman trip, served in Vietnam and said he hated coming back to people calling him names for wearing the uniform.